On An Overgrown Path: Are virtual concert halls the future of classical music? Are virtual concert halls the future of classical music? While researching my recent piece on Human League co-founder and surround sound proponent Martyn Ware I noticed a list of his top ten albums for headphone listening on the Bowers & Wilkins website. There are only two classical albums in the list, and neither Leonard Bernstein's Romantic Favourites For Strings nor Philip Glass' Koyaanisqatsi strike me as being notably headphone-friendly. In a recent Facebook post Ilan Volkov enthused about a rare performance of Éliane Radigue's Tibetan Book of the Dead inspired electronic masterpiece Trilogie de la Mort at Le Cube in Paris. This performance prompted Ilan to describe it as an "amazing work, so inspiring and moving" and my personal best classical albums for headphone listening* would definitely include Éliane Radigue's own truly mind-blowing studio recording of Trilogie de la Mort; this is released on the Experimental Intermedia label and was featured here in a 2010 post. The unique and immersive binaural sound of headphones was explored in a more recent post sparked by Neu Records surround recording of Ramon Humet's Niwa. 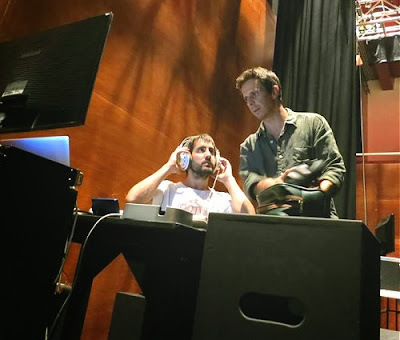 The header photo was taken at one of Neu Record's experimental surround sound sessions and their CD of Ramon Humet's music played by the London Sinfonietta directed by Nicholas Collon is another recommendation for headphone listening. Ilan Volkov's advocacy of Éliane Radigue's music started this path, and, coincidentally, his recording of Jonathan Harvey's Speakings with the BBC Scottish Symphony Orchestra is one of the best classical album for headphone listening. Speakings, which is scored for large orchestra and electronics, uses pre-recorded spoken sequences that are digitally modified and syncronised with the orchestral sound in real time and broadcast around the auditorium through an eight channel surround sound system. 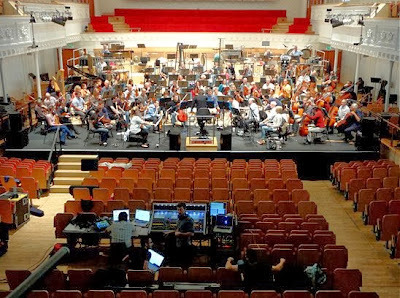 The photo below shows the venerable Usher Hall in Ediburgh transformed into a virtual concert hall complete with IRCAM created software for a performance of Speakings. On the CD, which was engineered by the BBC in Glasgow City Halls and released on the French Aeon label, Jonathan Harvey controls the spatial element, and listening to it on headphones produces a frisson that is absent with speakers. Back in 2006 I described how Loft Recordings, a small independent American record label, had used the then state-of-the-art digital technology to successfully create a virtual acoustic. Since that post was written there have been dramatic advances in computer technology, and the lifestyles, sensory hierarchies and expectations of audiences have changed dramatically. New audiences now want their classical music up front and personal, which means my post about how digital technology can build a virtual concert hall is a lot more relevant today than it was eight years ago. This path leads far beyond the best albums for headphone listening to the very future of classical music, because Jonathan Harvey's Speakings is - to use a much abused term - a seminal work in contemporary music which replaces the legacy constraints of brick and mortar concert halls with the infinite opportunities offered by new technology. In his 2010 radio interview with me Jonathan argued that classical music should drop its silly conventions, and auditioning Speakings on headphones shows that the orthodoxy of classical music being irrevocably wedded to a proscenium arch presentation is no more than one of those silly conventions. * My headphone listening is via a ThorensTD125/SME record deck or Arcam CD37 player into an Arcam Alpha10 integrated amplifier and Sennheiser HD 580 studio-quality headphones. For mobile listening an iPOd Nano and Sennheiser PX 200 foldable headphones are used, and my new 64-bit Dell PC has a 5.1 soundcard installed. ** Header photo via Neu Records and footer via Sound by Design. Any other copyrighted material on these pages is included as "fair use", for the purpose of study, review or critical analysis only, and will be removed at the request of copyright owner(s).Also on Facebook and Twitter.